Rockgardn is not a new company anymore and have become fairly well known for producing some quality products that you can depend on to protect you from the occasional biff. Every year the protective equipment market gets more and more competitive with the introduction of even more companies offering products. Rockgardn has grown to produce the line of products that have since the beginning plus an additional line of accessories and clothing for the motocross world. Rockgardn has produced their Flak Jacket upper body protection for a few years and today we take a look at the most recent version of the popular jacket. 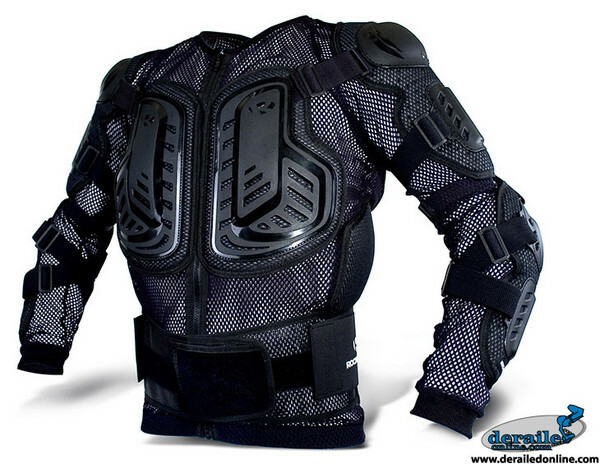 The most important aspect of body armor is how much protection it offers, else why are you buying it? Rockgardn has incorporated some padding around the lower rib cage beneath the arm pit but not so much that it hinders movement. In addition to the improved back slider, there are pads on the back of the jacket to protect your scapula. The rest of the jacket offers the standard protection areas that you have come to assume. The plastic protection plates are also ventilated and reinforced with a honeycomb-like molding on the back. What good is body armor if it doesn’t stay in place? Since a mesh doesn’t provide much structural support on a jacket you must rely on a good set of adjustable straps to keep everything in place. The Flak Jacket is not in short supply of adjustable straps to keep everything where it is supposed to be. Something that differentiates Rockgardn’s upper body armor from some of the other products on the market is the size of the straps. Rockgardn uses straps that are at least twice as wide of some of the other brands – no flimsy straps on these jackets. The overall fit of the jacket is excellent. It does not feel overly bulky when worn. 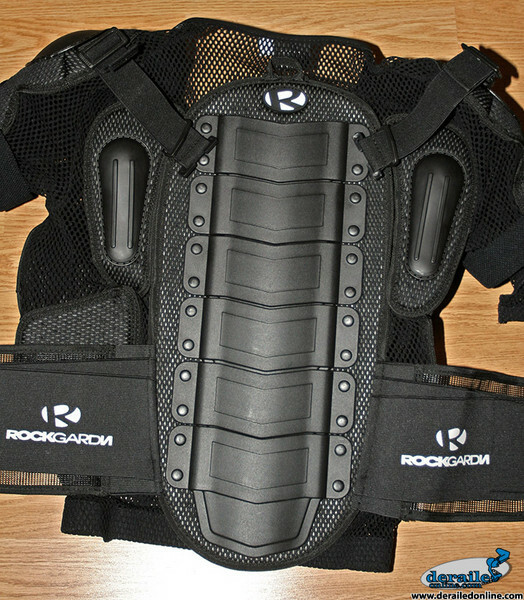 Rockgardn’s current Flak Jacket is a continuation of their previous product that has evolved and progressed with rider input. Some of the most noticeable features of the current and last years version of the Flak Jacket include: the knit mesh similar to other well known brands, detachable forearm protection, and a detachable back slider. The Flak Jacket still retains the very useful “stash” pocket that is incorporated into the kidney belt. Part of the rider input that went into this new Flak jacket is the attention to ventilation. The consideration for keeping cool did not stop at the knit mesh – the kidney belt is made from a plastic mesh with Velcro adjustment panels. 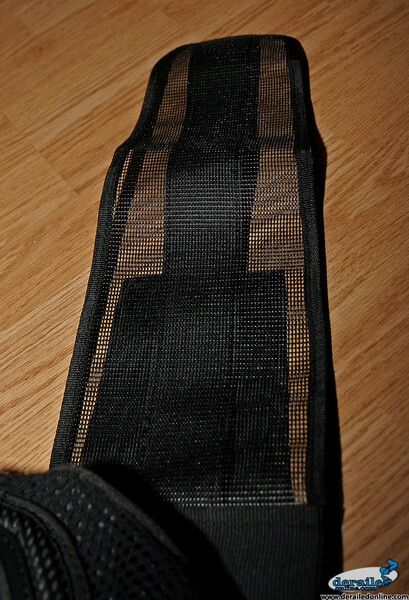 Rockgardn has changed the base component of their flak jacket to which everything is attached to a soft mesh material. This mesh material is similar to what other manufacturers use for their jackets. Previous Flak Jackets used a lycra/spandex base component of the jacket. The mesh material is considerably cooler than the lycra/spandex material that was used in previous versions of the Flak Jacket. Not a fault of the Flak Jacket specifically but I have never worn a jacket made from mesh material that feels comfortable enough to wear against your skin for any extended period of time. So for me I must use a base layer underneath the Flak Jacket to keep it from chafing. However; the previous material used – the lycra/spandex – did not require a base layer to be comfortably worn for a full day of riding. The detachable back slider can be replaced if it becomes damaged beyond repair. Replacement rivets – used to hold the plates to the foam - are also included with the jacket. Forearm protection on the jacket is attached to the rest of the jacket by a single Velcro strap and can be replaced if lost or damaged. Being able to remove the forearms is a great feature for staying cool while standing around, riding the lift, and riding the shuttle at your local riding spot in situations where you don’t have enough time to take the jacket completely off. The straps on the forearms are very good at keeping them from moving so the small straps that attach the arms to the rest of the jacket are not that important as far as function is concerned. Despite the advantages of the detachable arms it does create an inconvenience when you go to put on and take off the jacket. You quickly learn that it’s best to put on and take off the jacket without the arms attached. The mesh kidney belt has two adjustment straps on the left and right side that allow adjustment of the belt to fit your mid section. The stash pocket is still retained and makes a great place to keep your keys or a small trail tool. The plastic mesh is more rigid and holds its shape more than the typical stretch material that most all kidney belts. The one problem with the new kidney belt is the hook side Velcro used to keep the belt attached is not wide enough and when you have more bulky items in the stash pocket it tends to want to come loose when compress your abdomen. Not a fault of the Flak Jacket specifically but I have never worn a jacket made from mesh material that feels comfortable enough to wear against your skin for any extended period of time. So for me I must use a base layer underneath the Flak Jacket to keep it from chafing. It is however dramatically cooler than a non-mesh jacket. Great fit and great protection are the two best performing characteristics of the Flak Jacket – the two that matter most when selecting a piece of body protection. Ease of use is where the Flak Jacket falls behind other offerings. But the cause of this – the detachable arms – creates some more flexibility in the jacket itself. Rockgardn has a stellar track history when it comes to products that last a long time, not something you crash in once or twice and have to replace. Score Card is based on a five point system - five being highest mark. Posted on May 16, 2007 14:28:11 -0400 by Brady.